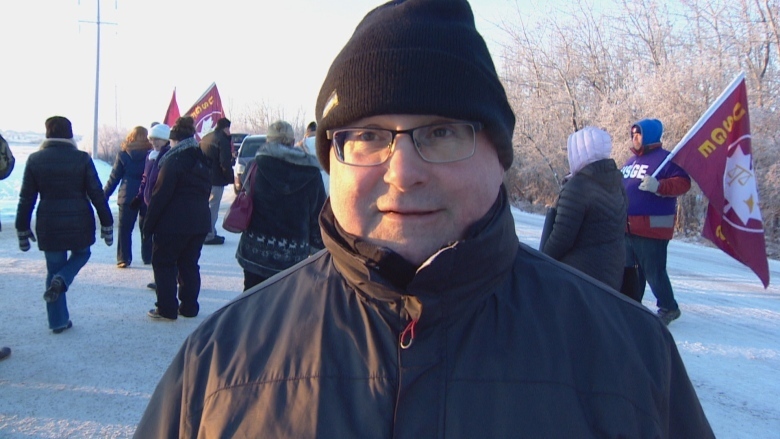 A workers' union staged an information line outside the Edmonton Institution on Thursday in support of staff who work inside the maximum-security prison in what has been called a "toxic culture." "Edmonton Institution has been going through some difficult times and a lot of the staff are suffering because of the activity that has been happening on the inside," said Stan Stapleton, national president of the Union of Solicitor General Employees. 'We're here about trying to create a better workplace, about wellness, and supporting our members and the staff here," Stapleton said. The USGE represents public service workers across Canada's federal justice system. In October, a CBC News investigation revealed that two major investigations are underway after serious allegations of harassment, intimidation and inappropriate employee conduct by staff at the prison. Several employees were suspended in relation to the allegations. CBC also uncovered new details about allegations of workplace sexual harassment at the facility. In June, CBC News cited an internal report from Correctional Service Canada describing a toxic culture at the Edmonton Institution where inappropriate behaviour by staff often goes undisciplined and employees are afraid to tell managers about infractions for fear of retribution. On Thursday, about 35 people were on the information line, some wearing placards with messages such as "Stop the harassment" and "No bullying." Workers entering the prison for their shifts were handed information sheets explaining why they should be concerned about reports of bullying and harassment that have been going on "for years." "CSC must institute meaningful and lasting change in our workplaces with significant input from the unions that represent its employees,'" the information sheet said. "In this imperfect environment we encourage USGE members who work at Edmonton Institution to immediately report harassment and bullying to USGE representatives." Stapleton said the union met with the prison's warden early Thursday and would be meeting again with her in the afternoon. "We're going to have a little bit more talks about how we might improve the worksite."